Ever wanted to go to a black-lit fish market? Now’s your chance. At CSUN’s West Gallery in the art department, professor Edie Pistolesi, with the help of several other art professors, worked with about 160 students to create a radioactive seafood market to symbolize the dangers of nuclear activity. The exhibit, two semesters in the making, is open a month after the March 11 anniversary of the Fukushima Daiichi nuclear plant meltdown, which Pistolesi says has been referred to as “3/11” because of how catastrophic it was. The gallery entrance is covered by black fabric to keep the room dark. 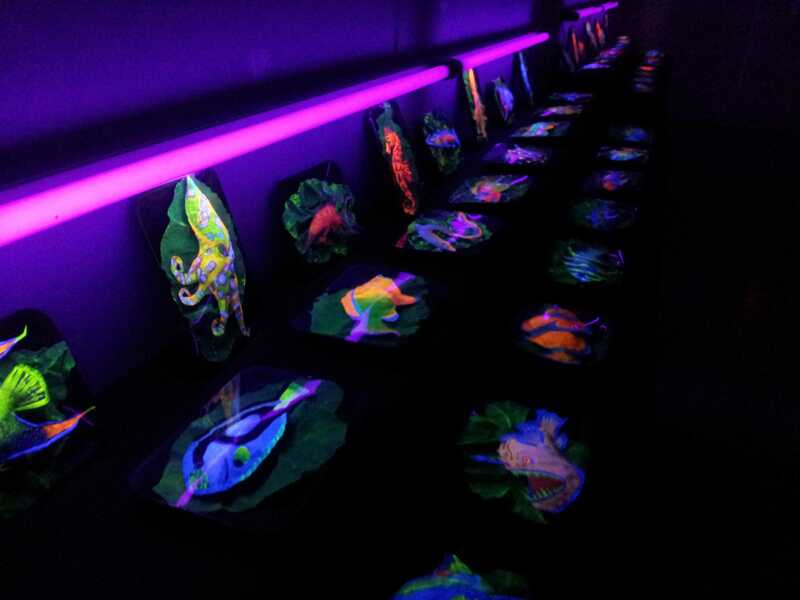 Inside, glow-in-the-dark fish line the walls, illuminated under black lights. Several large bright tuna hang along the back, while smaller fish and octopi lay shrink-wrapped in meat deli-style trays, waiting to be consumed. The neon colors are quite stunning. “We’re using beauty as a weapon to show everyone who sees this that there’s something wrong here,” Pistolesi said. The fish are made out of butcher paper and fluorescent paint, put together by mostly-non art majors. “When you stop seeing trash and you start seeing amazing fish, there’s a transformation,” Pistolesi said. Vincent Nelson, a senior sculpture major, stopped outside the gallery to talk to Pistolesi about the project. The exhibit will be open during regular gallery hours until April 24. What in the world is sustainable food?